Telecom networks are witnessing a paradigm shift with the evolution of Network Function Virtualization (NFV). Adopting NFV helps them to significantly increase service agility, as well as realize savings in operational expenses. In addition, with most of the telecom operators moving to LTE for data and IoT scenarios, successful voice over long term evolution (VoLTE) service deployment is emerging as a critical business necessity. The key challenge is successful migration or expansion from physical to virtual LTE mobile cores, and successful deployment and verification of VoLTE services without compromising on the customer Quality of Experience (QoE). Therefore, testing of VoLTE services in a virtual LTE mobile core across the entire lifecycle during evaluation, field-trial, commercial deployment, and optimization phases and timely verification are vital to ensure scalability and interoperability. 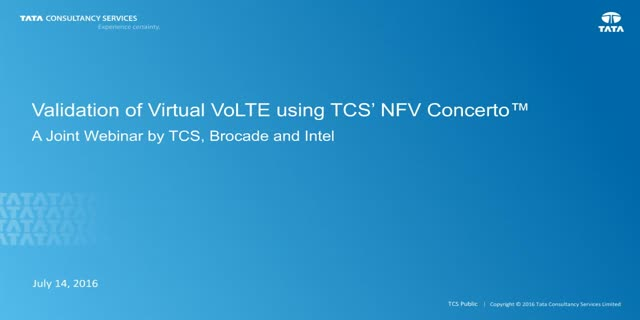 Tata Consultancy Services' (TCS') NFV Concerto is a comprehensive framework that provides end to end VoLTE verification in a virtual LTE mobile core, with fully automated orchestration, verification of lifecycle events, scaling, performance, resiliency, and functional testing. TCS has partnered with Brocade and Metaswitch and used NFV ConcertoTM to enable seamless integration, validation and pre-deployment certification.